March 30, 2017 | LITTLE ROCK — A $1.7 million grant from the National Cancer Institute of the National Institutes of Health (NIH) will allow a University of Arkansas for Medical Sciences (UAMS) researcher to study a potential new therapy to reduce the risk of blood cancer caused by ionizing radiation. Daohong Zhou, M.D., was awarded a $1.7 million grant from the National Cancer Institute for his research on the prevention of radiation-induced cancers. Daohong Zhou, M.D., was awarded the grant for his research team’s work addressing whether the ability to restore the fitness of a person’s blood cell-generating cells — called hematopoietic stem cells (HSCs) — after they undergo radiation can prevent blood cancers such as leukemia or bone marrow disorders known as myelodysplastic syndrome (MDS), all of which are induced by ionizing radiation. “Earlier this year, we published a study showing that chemotherapy induces cellular aging, also called senescence, in normal tissue and promotes adverse effects such as fatigue, cancer relapse and metastasis. Now, we will test whether restoring fitness to blood cell-generating stem cells by selectively eliminating old and damaged HSCs after ionizing radiation exposure has the potential to prevent MDS and leukemia from occurring,” said Zhou, associate director for basic research in the UAMS Winthrop P. Rockefeller Cancer Institute. To eliminate the old or senescent cells, Zhou’s team will use a senolytic drug discovered by his research group a year ago. Senolytic drugs selectively kill old or senescent cells. Out of all cases of MDS and leukemia, up to 20 percent are considered to be caused by ionizing radiation exposure and chemotherapy. These therapy-related diseases also represent the most serious long-term complications for patients with Hodgkin and non-Hodgkin lymphoma and several other cancers. The incidence of ionizing radiation-induced blood cancers is on the rise due in part to the increased life span of both pediatric and adults cancer survivors who require not only radiation therapy to treat their initial cancer diagnosis, but also multiple CT scans over their lifetime to monitor for a possible recurrence. Cancer patients may undergo several types of treatment and testing that uses ionizing radiation, including radiation therapy, CT scans, PET scans and X-rays. The team of research includes staff member Jianhui Chang and postdoctoral fellow Yingying Wang, Ph.D., in Zhou’s lab, and Zhou’s collaborators, Martin Hauer-Jensen, M.D., Ph.D., and Rupak Pathak, Ph.D., at UAMS and Michael Thirman, M.D., and Roger Luo, Ph.D., at the University of Chicago. Zhou is hopeful that his research may also have other applications. “Cellular senescence not only occurs due to radiation exposure; it occurs when a person undergoes chemotherapy and as part of the normal aging process. 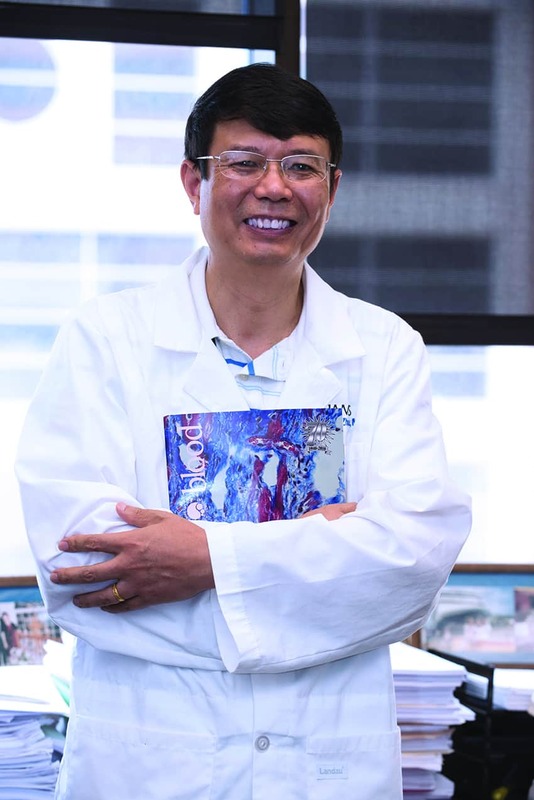 We hope to show the potential of senolytic drugs to reduce malignancies of the blood caused by chemotherapy or new cancers caused by aging,” said Zhou, who holds the Distinguished Winthrop Rockefeller Endowed Chair of Leukemia and Lymphoma Research at UAMS. 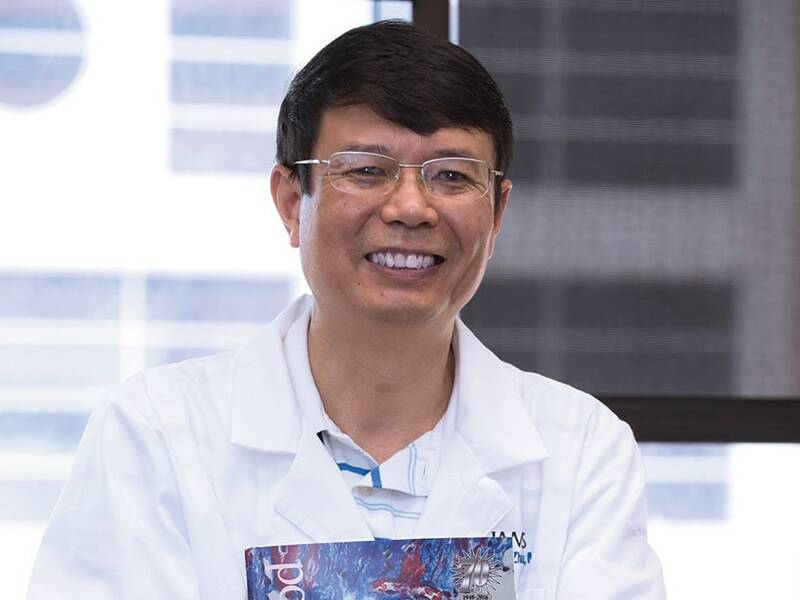 Zhou is also a professor of pharmaceutical sciences and deputy director of the Division of Radiation Health in the UAMS College of Pharmacy’s Department of Pharmaceutical Sciences.